Obama at US Mission Says UN Words Must Have Meaning, Arms Embargo Excluded? UNITED NATIONS, March 29 -- As the US administration suggests it could arm Libya rebels despite UN Security Council arms embargo, President Obama on Tuesday came near but not into the UN. Before heading to a $30,000 a plate fundraiser for the Democratic National Committee at the Red Rooster restaurant in Harlem, Obama praised Ron Brown, for whom the new US Mission to the UN building is named, at the suggestion of Charlie Rangel, also present. Obama said that UN words “must have meaning.” Some wondered if that applied to the arms embargo on all sides in Libya in Council Resolution 1970. The US is arguing that a “notwithstanding” clause in Resolution 1973 about protecting civilians means they could give offensive weapons to the rebels. The Permanent Representatives of Russia and India have told Inner City Press they disagree. Inner City Press has asked the US Mission to the UN to explain their argument, and “If the US were to move to fund the rebels, would it inform (and, separately, seek guidance or approval from) the UNSC Sanctions committee first?” So far answers have not been provided. In fairness, the US Mission to the UN did answer an Inner City Press question about if anti-Gaddafi dipomats Ibrahim Dabbashi and Shalgam are invited and present at President Obama's dedication of the Mission's new building. “Shalgam is here,” the Mission informed Inner City Press, adding in response to a follow up there there is no list of attendees, at least not one what would be provided. China said that its Permanent Representative Li Baodong would attend, and on the NY1 broadcast is appeared that Hardeep Singh Puri of India was there. He also told Inner City Press that the Libya resolutions do not permit arming the rebels, “and you can quote me,” he said. The dedication began with Susan Rice introducing the “incomparable” Patti Labelle, who sung a creative version of the National Anthem. 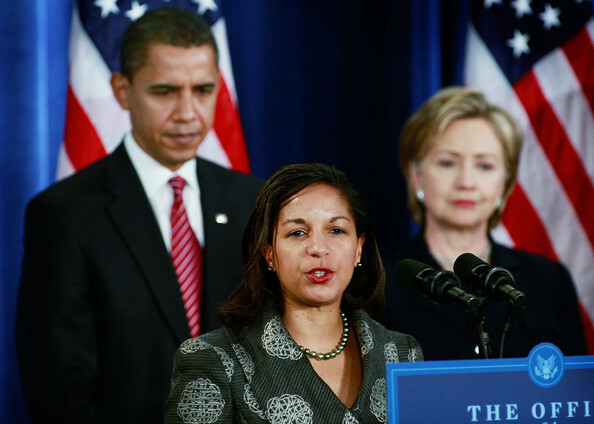 Susan Rice spoke about traveling to Africa with Ron Brown in 1995, when he said the US would never again concede African markets to former colonial powers. She did not mention Rwanda and its genocide the year before, which the Clinton Administration blocked discussion of, or at least action on, in the Security Council. The middle speaker was Bill Clinton himself, who also thanked Charlie Rangel, referring to his Clinton Foundation office in Harlem. That's were Obama is headed, to the Red Rooster restaurant at $30,000 a plate to benefit the Democratic National Committee. Inner City Press is informed that there are protests planned, including on the issue of gentrification. Watch this site. UNITED NATIONS, March 29 -- While the chairman of the UN's Libya Sanctions committee says that arming the rebels would be impermissible, and the Permanent Representatives of Russia and India told Inner City Press just that on the morning of March 29, Secretary General Ban Ki-moon apparently, or conveniently, takes no position. Inner City Press at the noon briefing asked Ban's spokesman Martin Nesirky for if it is Ban's understanding that the arms embargo of Resolution 1970 still prohibits arming the rebels, despite the protection of civilians “notwithstanding” clause of Resolution 1973. “I think that's for the Security Council to determine,” said Nesirky, who had just said that “the ceasefire means what is says,” a ceasefire on both side. Why would Ban opine on one portion of the resolutions and not another? Inner City Press pointed out to Nesirky that Ban's predecessor was willing, at least once, to opine on the legality of a Permanent Council member's action. The US, notably, is now arguing that the resolutions give the “flexibility” to arm the rebels, and France is saying it is ready to talk about it, seemingly not through the UN Security Council. It's a battle among the Permanent Five members of the Security Council, for now with US and Russia with directly opposite positions. On March 29 Inner City Press asked Russian Permanent Representative Vitaly Churkin of the resolutions permit arming the rebels. “No,” Churkin, noting that the US had asked for the arms embargo. Ambassador Rice said thanks for the information about what Churkin had said. Inner City Press has asked the US Mission to the UN to explain their argument, and “If the US were to move to fund the rebels, would it inform (and, separately, seek guidance or approval from) the UNSC Sanctions committee first?” So far answers have not been provided. But, in fairness, the US Mission to the UN did answer an Inner City Press question about if anti-Gaddafi dipomats Ibrahim Dabbashi and Shalgam are invited and present at President Obama's dedication of the Mission's new building. “Shalgam is here,” the Mission has informed Inner City Press. Later, Obama is headed uptown for a $30,000 a plate Democratic National Commitee fundraiser at Red Rooster. Inner City Press is told there will be protests. Watch this site. UNITED NATIONS, March 29 -- Libya sanctions and arms embargo were the topics on Tuesday morning outside the Security Council, even as the meeting inside concerned Lebanon. The Netherlands has formally written in under Resolution 1973 to join the coalition, a well placed Council source exclusively told Inner City Press. An explanation of Malta's query to the Libya Sanctions Committee was finally gleaned, as another Inner City Press exclusive: Malta stopped a Greek ship from delivering petroleum products to a subsidiary of the Libyan national oil company. The subsidiary is not on the UN sanctions list. But it is on the European Union list. Malta 1, Greek ship 0. Other battles are not so clear. Inner City Press asked India's Permanent Representative Hardeep Singh Puri for India's position on if arming the Libyan rebels is permitted. No, he said, adding, and you can quote me. Inner City Press asked Russian Permanent Representitive Vitaly Churkin, is arming the rebels permissible under Resolution 1973? No, he said, shaking his head. He noted that it had been the Americans themselves who asked for the arms embargo. While no answer was gleaned from US Permanent Representative Susan Rice despite a question proffered at 10:16 am as she entered the Council and 11:10 am when she left, it is understood that the US dispute an account of the negotiation of Paragraph 4 of Resolution 1973 in which Ambassador Rice said that the “notwithstanding” phrase was needed in case the US had to go in with weapons to save a downed pilot. The US, it is understood, says that referred to only precluding an occupation and not an intervention. But with Libyan Sanctions Committee chair Cabral now twice issuing an interpretation that arming the rebels is not permissible, Russia and India on the record and others with the same view, including China Inner City Press can report, could the US “just do it,” in the Nike phrase? Another member of the “Coalition” tells Inner City Press that while the “notwithstanding” phrase is somehow clear, his country believes that enforcing the no fly zone is the way to go. If somehow the no fly zone weren't being enforced, perhaps giving air defense equipment to the rebels could construed as protecting civilians. But to give offensive weapons? Even the non-US coalition member said no. But again: might the US “just do it,” in the Nike phrase? Footnote: for President Obama's visit today to the UN, or the US Mission across First Avenue from the UN, press access has been limited to a “pool” from the White House press corps, as well as Mission selected journalists from the UN press corps. There's some grumbling, the substance of which is that a White House based reporter might miss some UN relevant details, including regarding which diplomats are invited. We'll have more on this.